Wir verwenden nurdie beste Materialen und unsere Produkte harten Prüfverfahren unterziehen damitdie in anspruchsvollen und belebten Umgebungen wie in Ihrem Haushaltfunktionsfähig bleiben — jahrelang. Eine perfekte Passform damit sie nicht verrutschen und vollkommen verborgen bleiben. Besonders widerstandsfähige Kunststoff und die dicken Doppelnäht verhindern Risse und Löcher. Der leicht zu lösende Knauf unseres Küchenrollenhalters ermöglicht ein schnelles Auswechseln der Rollen. Der extra schwere Fuß aus Edelstahl verleiht dem Küchenrollenhalter Stabilität. Die erhöhte Kante verhindert das Aufdrehen der Rolle. sobald das Produkt wieder verfügbar ist. Um Rollen schnell und einfach auszuwechseln, drücken Sie einfach die Knöpfe: so lässt sich der Knauf entfernen. Der extra schwere Fuß aus Edelstahl verleiht dem Küchenrollenhalter Stabilität. Wir verwenden die besten Materialien und solide Konstruktionen, damit Sie jahrelang Freude an unseren Produkten haben. I love this holder. It stays put when you pull the kitchen roll as it's heavy enough to stay in place without the need to hold it. Also, it is nice and tall so it takes the new tall thick kitchen roll that I prefer to buy. Love that it is easy to empty and reload with the press button sides on the top. My only negative comment on it is that the stainless steel does mark easily and needs constantly rubbed/polished to stay fingerprint and splash-mark free. 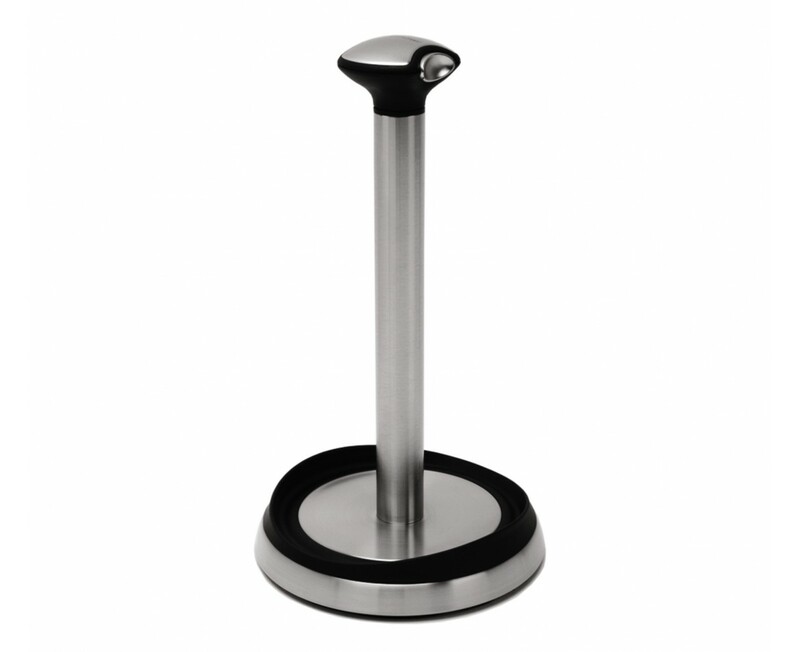 really good bit of kitchen equipment - solid and heavy enough not to fall over all the time and looks good too. The is a replacement for a previous similar device that lasted fifteen years. This one looks to be in that same quality category, and I'm hoping it lasts as long as I do! This product works just as you advertised. We are more than happy with it and would recommend it to anyone. This is a really nice, no-frills paper towel holder. It's a solid build, doesn't feel cheap or flimsy anywhere. The base is heavy enough to keep it from sliding around. It does its job well and looks good doing it. Hands free removal of paper towels is great. Easy to replace roll. It looks good on the kitchen counter. I use it dozens of times a day and it always stays in place. Thanks Simplehuman for a heavy weight, good looking, paper towel dispenser. I love how sturdy and well designed this is. It's stable and simple to replace rolls on. The look works well and appears designer craftsmanship. The rubber lip works great on name brand paper towels but could be a little higher to add tension when tearing cheap paper towels. This is simply the best towel dispenser I've ever had, and has earned a place in all the bathrooms and the kitchen in my house. How did I ever live without it? It looks really nice. It sits out but doesn't look out of place. It is very well made and durable. This is a wonderful- quick changing paper towel holder...simple click of a button & you're ready for a new role! Not a fan of the turn top to change out a role of paper towels. I cannot put holes in the walls to hang a paper towel holder in my new rental place, so this was the next best solution. Looks nice on the counter and functions as advertised. bought this because of the great reviews. notice rust spots on the bottom plus the bottom is a catch-all for crumbs. We're sorry to hear about the rust. A Customer Service Representative will contact you shortly to assist you with your problem. This is the easiest papertowel holder ever. Just squeeze, take off the old roll and plop on the new one. Purchased one for the office. Holds the towels strongly, without tipping over. So easy to load and use...even my husband commented on how much he liked it! I would recommend it without reservations. Over the years, I've tried almost every paper towel holder ever designed and none of them comes close to this one. Easy to use, good looking, easy to keep clean, well made, yadda yadda yadda. Anyone who is in my kitchen raves about it and wants to know where to get one. My pet sitter loved it and bought one of her own. What more can I say? 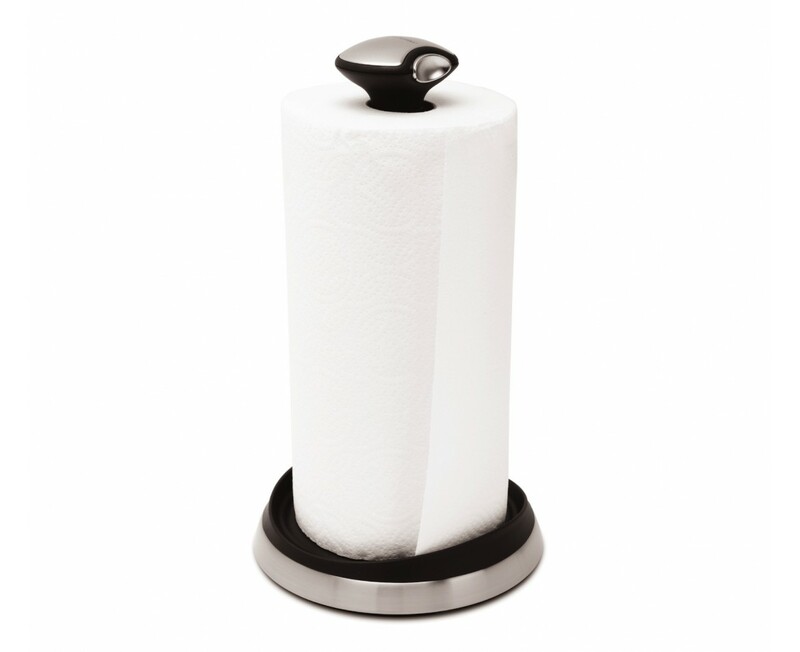 This paper towel holder is elegant, works, and is totally functional and easy on the eyes. Fits with any decor. This has to be one of the best paper towel holders I have ever bought!!!! It is super easy to load new rolls of paper towels, as well as never moving no matter how fast I pull a sheet of towel off. I am constantly cooking something so I go through at least one roll a day. Also it is very stylish and will blend into any kitchen. The design of this product is perfect!!!!!!!!!!! Everyone must have one to make life in the kitchen a lot easier. It is a nice, solid counter piece that doesn't bounce around when pulling paper towel sheets off. The top piece comes off easily when replacing rolls - a great feature because most dispensers are annoying screw offs. Overall a good quality purchase. The paper towel holder is sturdy and matches well with other stainless kitchen appliances. It is made well and much better then some cheaper imatations. I like it's looks and the heavy solid base. I purchased this item as a housewarming gift. I think it is a great product, as we have had one for some years.